So, the one thing that has annoyed me the most on my HTC Sensation with the internet browser and Android Market 3.x is the fact that both take way too long to load up anything! I thought it was partly due to the amount of junk that loads on the screen the moment I open it, but apparently it is due to other issues; namely DNS resolution over WiFi. This makes sense as I am unable to really use my phone during the day at work, and really, the only time I use it is at home over my very own WiFi connection. The developer also states that this is to be used for poor DNS resolution over 3G as well. So it seems that these URLs used for Google Market and the browser are effecting more than home or business ISP DNS resolution. temasek over at XDA Developers forum has posted a new application that you can currently download from the Android Market. 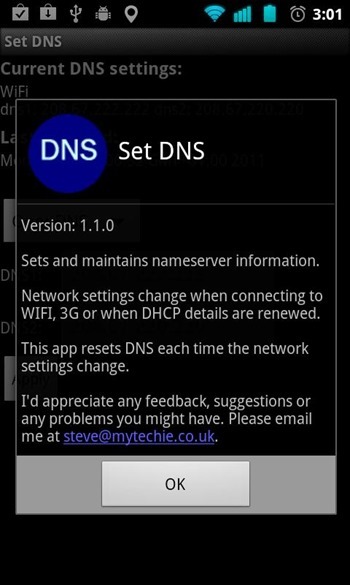 The application is called Set DNS and was created to improve DNS resolution for the Android Market. Once installed you can point to any DNS entries listed in the application and see if they improve your Android Market load time over WiFi. I personally have not been able to try this out yet but we’re seeing buzz that this is, in fact, helping users out to a great extent. The different DNS’ you can use after installing the app include: Google DNS, OpenDNS etc. Its preferred that you have a rooted device but the developers has explained in the app description on the Android Market that the next release of Set DNS will lift the requirement of root, therefore it will run on non-rooted devices. SetDNS is the easiest way to force your rooted phone to use custom nameservers on WiFi AND 3G/mobile networks. 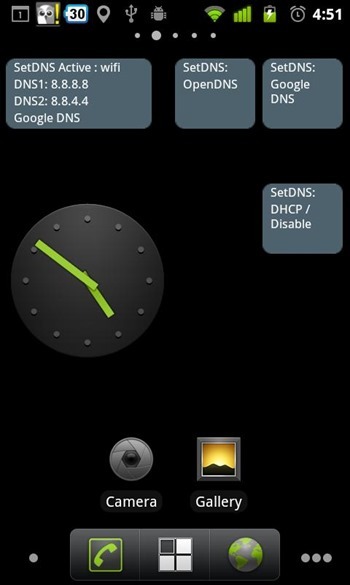 You can also set widgets on your desk top so you can set the DNS settings you prefer quickly from your home screen. This should make fixing those issues much faster without having to open up the app and cycling through the different options. The latest Android Market which was pushed out a few days back is a great treat to use, it brings in some cosmetic changes and gives users a taste of the upcoming iteration of Android: Ice Cream Sandwich. But, the load times have been a bit cranky for some users, we’re hoping that Set DNS will turn the tables and prove as a good fix until Google resolves the issue from their end or update the Android Market. The browser however, is one of the fastest we’ve seen on a mobile device, provided you have good hardware to go with. Set DNS is something which would significantly cut down the load times over both 3G and WiFi.